The Faroe Islands are part of the Danish Kingdom, but there is little Copenhagen can do. There are a surprising number of Russians here in Torshavn, the capital of the Faroe Islands; the small semi-autonomous sub-Arctic nation of 18 islands out in the middle of the North Atlantic and suddenly the cause of serious consternation in Copenhagen, the capital of Denmark, to which the Faroe Islands still belong. An impressive wooden training ship, the Sedov, Russia’s largest, docks in Torshavn’s harbor and scores of restless young Russian cadets with caps the size of frying pans wander Torshavn’s narrow streets. 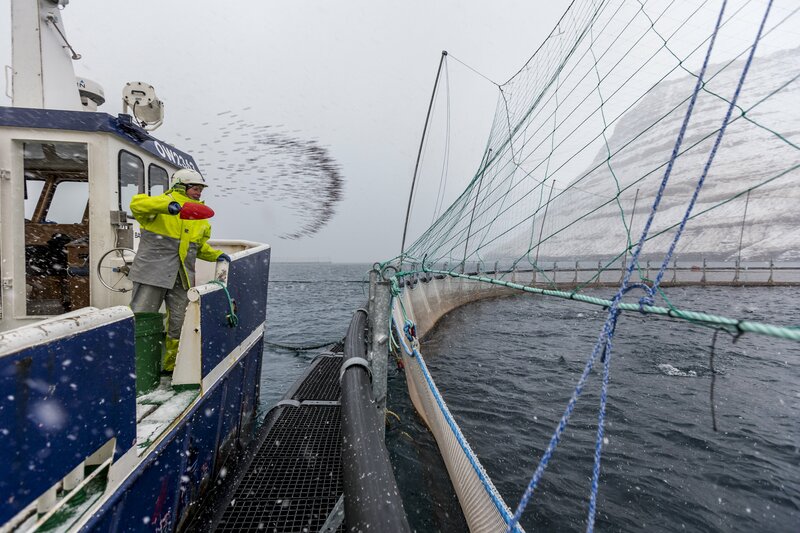 The Russian minister of fisheries is visiting and Bakkafrost, the largest salmon producer on these islands, is host to a group of Russian wholesalers looking for fish. This Russian congregation is purely coincidental, but quite symptomatic. Faroese politicians tell me repeatedly how Faroese relations with Russian go way back. Russia and the Faroe Islands have had agreements on how much fish to catch in the North Atlantic since the 1970’s, and as we settle down to talk, Poul Michelsen, the Faroese government’s 72-year-old foreign minister, tells me how his father, when he was waterchief in Torshavn in the 1950’s, sold fresh water to fleets of visiting Russian fishermen. Michelsen wants to convince me that it is only fair and legally and politically reasonable that he and his government is placing their nation outside the rest of the Western world when it comes to sanctions against Russia. The political leaders of the Faroe Islands were some of the only key political decision makers in Europe to refuse to sign up behind the international sanctions imposed on Russia after the Russian military annexation of Crimea — legally a part of Ukraine — back in 2014. In March this year, following two murders by poison in Great Britain, Denmark did what other European countries did and expelled two Russian diplomats. Shortly afterwards, Michelsen made it clear that the Faroese — even if it is a part of the Danish Kingdom — did not support this line of action. Then, on August 24, Michelsen signed a new memorandum of understanding with Russia to bolster more trade and cooperation. In a ceremony in his office in Torshavn, Michelsen co-signed the agreement with Tatiana Valovaya from the Eurasian Economic Union which represents Russia and five former Soviet republics, now independent countries. The benefits of the good relations with Russia are felt all over the Faroe Islands. Sales of salmon and mackerel in Russia now amount to some 2.5 billion Danish kroner or $311 million — a phenomenal figure in this tiny nation. The Faerose economy grows by 6 to 8 percent per year these days — almost Chinese growth rates. Unemployment is all but eradicated and more young people return from abroad. The number of people on the Faroe Islands recently surpassed 51,000, for the first time in history. There is no applause from Copenhagen. According to a number of leading politicians in the Danish parliament, the Faerose act in direct violation of the spirit of a Europe united in an attempt to knock some sense into Russia’s leadership. For four years, the Danish critics say, the EU — including Denmark — has tried to convince Russia that the annexation of Crimea was and still is a completely unacceptable attack on the bedrock of international law and on civilization as we have known it since World War II. Michael Aastrup Jensen, a member of the Foreign Policy Committee of the Danish parliament for Denmark’s main ruling parti, Venstre, gives it to me straight: “My personal opinion has long been clear. I find it highly problematic that the Faroe Islands now enters into a new agreement with Russia and a number of Russia’s closest allies. The Faroese act against all other countries and territories in the European Union, who are trying to isolate Russia and stop the kind of power politics that Putin engages in towards Crimea, towards Georgia and other nations. I find it very, very unfortunate for Denmark and Europe that we have a part of the Danish realm that makes this kind of deals.” Aastrup Jensen fears that Russian President Vladimir Putin will use the Faroe Islands for propaganda purposes, and he warns the Faroese that animosity towards the islands may spread in Europe. Several other leading politicians voice similar frustration. No one in the Faroe Islands tries to dodge that it is all about money. First, it would hurt the Faeroes economy unreasonably hard, he finds, if the Faroe Islands backed the sanctions and then lost its access to the Russian market: “We would go bankrupt the day after. We don’t have any product we can sell except fish. Also, we have fisheries agreements with Russia in the North Atlantic that have to be renewed every year. It would have untold consequences for us if that relationship went sour,” he says. Second, he notices how all EU countries including Denmark still sell all the goods to the Russian market that Russia wants to buy. Denmark still exports beef and machinery to Russia, even if Russia does not want to buy Danish pork. “Denmark applies double standards in this case. Denmark increases its trade with Russia wherever possible, while they talk about our lack of moral values,” Michelsen says. Third, he points to the internal mechanics of the Danish Kingdom. According to the Danish constitution, the Faroe Islands (and Greenland) cannot conduct foreign politics; that is a prerogative of the Danish government in Copenhagen. In Michelsen’s interpretation this means that he is not obliged to have any opinion on any sanctions against Russia or related matters — and the fact that Denmark supplies an annual grant to the Faroese nation to the tune of 642 million Danish kroner (or about $100 million) does not change anything: “Our cooperation with Denmark does not include foreign policy. We have not been asked, what we think. Why then should I have an opinion?” he asks me. “It is not that we want revenge. But we learned how important it is not to be over dependent on one single market,” Michelsen says. For four days I try to find dissent — among bus drivers, in Torshavn’s Rotary club and elsewhere. But I encounter not one person who disagrees with the way the Faroese leaders deal with Russia and the EU sanctions. One expert, Hermann Oskarsson, intrigued me in particular. Well known for his critical integrity, he is the former head of Búskaparráðið, the Faroese Economic Council, an independent body of economists, and now a lecturer at the University of the Faroe Islands. He compares the Faerose government’s approach towards Russia to the visits paid by the Danish Queen and Danish politicians to the regime in Saudi Arabia, a regime he calls “bestial” but also an oil-rich regime which Denmark cannot, it seems, afford to offend. Meanwhile, as individual politicians in Denmark continue to rain anger and frustration on the Faroese politicians, the Danish government is tellingly quiet. It is squeezed between the EU on the one hand, and its desire to remain cordial with the Faroes on the other. Also, legally speaking, the Danish government has found nothing to pick on in Torshavn. The Faroe Islands, unlike Denmark, was never part of the EU and is not bound by any sanctions designed in Brussels. Also, the EU sanctions do not prohibit exports of fish to Russia. It was only the Russian counter-sanctions, in place since 2014, that put fish on the agenda. Fish was on the list of goods Russia did no longer want to buy from any EU country. Russia quickly and specifically announced that the Faeroe Islands were exempt from these bans; fish from the Faeroe Island were very welcome in Russia; perhaps because the then head of the Faroese government, Kaj Leo Holm Johannesen had quickly flown to Moscow to make it clear that he and the rest of his government did not support the EU sanctions. The EU-Russian conflict has now lasted, as mentioned, for four years. As far as I know, there is no end in sight, and the Faroese will certainly continue to sell fish. This disagreement between Denmark and the Faroes is likely to be with us for some time.